황남대총 남분 금제 관식(皇南大塚南墳 金製冠飾)은 경주시 황남동 미추왕릉 지구에 있는 삼국시대 신라 무덤인 황남대총에서 발견되었다. 황남대총은 2개의 봉분이 남·북으로 표주박 모양으로 붙어 있다. 이 관식은 황남대총 남쪽 무덤에서 발견되었으며, 높이 45㎝, 날개 끝 너비 59㎝의 크기이다. 3매의 금판으로 구성되어 있는데, 가운데 금판은 위에 3개의 돌출된 부분이 있어서 전체가 山자 모양을 하고 있다. 아랫부분은 차츰 좁아져서 V자 형태를 이루고 있으며, 이 가운데 금판 좌우에 새 날개 모양의 금판을 작은 못으로 연결하였다. 전면에 작은 원형 장식을 달았으나 가운데 금판 밑의 관(冠)에 꽂게 된 부분에는 장식이 없다. 관 장식의 가장자리에는 작은 점을 찍어 처리하였다. 가운데 금판은 세로 중심선에서 안으로 약간 접은 상태로서, 밑의 뾰족한 부분을 어느곳에 꽂기 위한 형태라고 생각되지만 평소에 썼던 관의 일부인지 용도는 확실하지 않다. 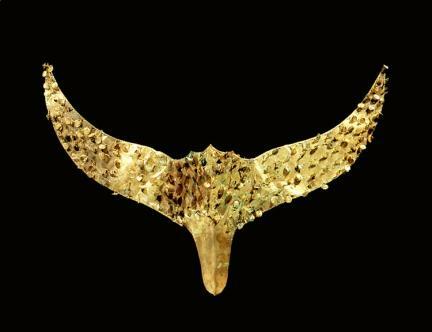 This diadem ornament was found in the south mound of Hwangnamdaechong Tomb. It is 45 cm in height and 59 cm in width (the length between the two wing tips). It is made up of three gold plates. The middle plate has three projections in the upper part and so the whole shape looks like the Chinese character 出. The lower part gets narrower towards the end, forming a V. On both sides of this middle plate, plates in the shape of birds’ wings are connected with small nails. There is a small circular ornament on the front. However, there is no decoration on the lower part of the middle plate, which is supposed to be fixed to the diadem. The edge of the ornament for the diadem is decorated with minute dots. The middle plate is folded a little inwards lengthwise, which makes it probable that it was usually stuck into something else. However, it is not certain whether it is a part of the diadem worn every day. Similar ornaments for a diadem have frequently been excavated from Gaya tumuli. Hwangnamdaechong Tomb is a Silla tumulus and is located in Hwangnam-dong, Gyeongju, Gyeongsangbuk-do. Its Gyeongju Tumuli serial number is Hwangnam-dong tumulus no 98. It was excavated and researched by the Office of Cultural Asset in 1973 and 1975. Today the outward form of the tumulus is restored. Two mounds connected north and south give it the shape of a small gourd. It is the largest mound from the Silla Period. Its breadth is 80m east-west, 120m north-south. The height of the south tumulus is 23m and that of the north tumulus is 22m.